30519 Rolex 116400 Milgauss Blue Dial Green Crystal, 116400GV, stainless steel on a stainless steel oyster bracelet, automatic movement, COSC, blue dial with luminous hour markers and hands, lightning shaped second hand, screw down crown, green sapphire crystal, water resistant, scrambled series, diameter: 40mm, thickness: 13mm, Like New with box and papers dated February of 2015. 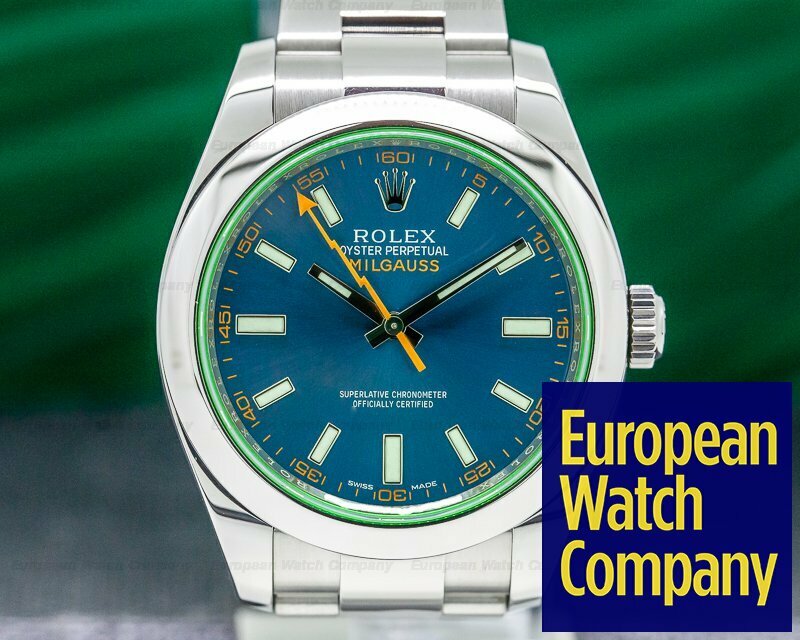 This is a 904L stainless steel Rolex Milgauss, 116400GV. 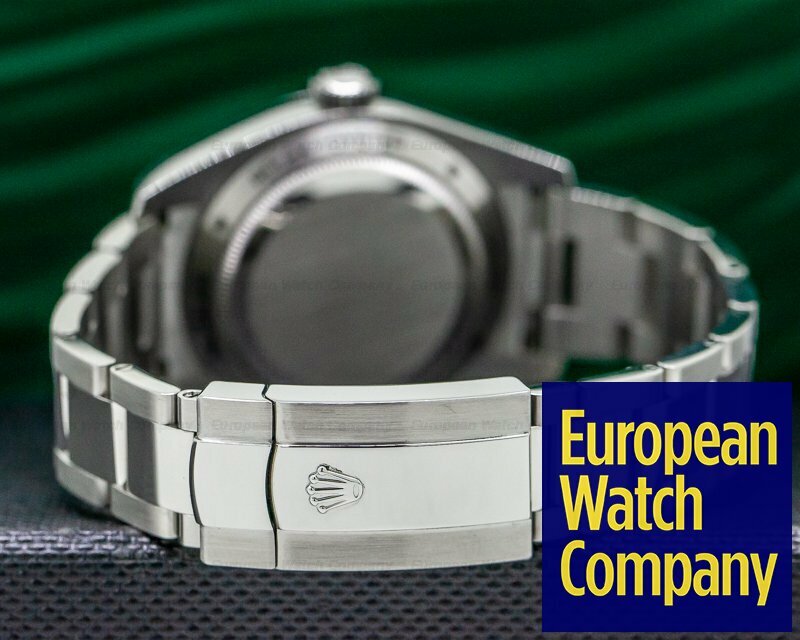 It has an integral stainless steel Oyster bracelet with a double deployant clasp, and a distinctive scratch resistant domed green sapphire crystal. 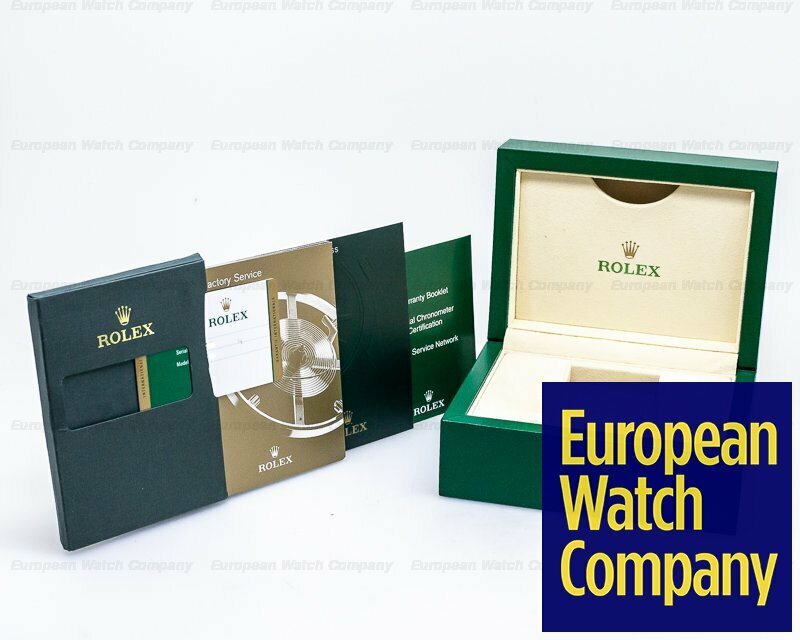 It's made with ferromagnetic materials and an anti-magnetic shield, making the movement resistant to a magnetic flux density of 1,000 gauss. 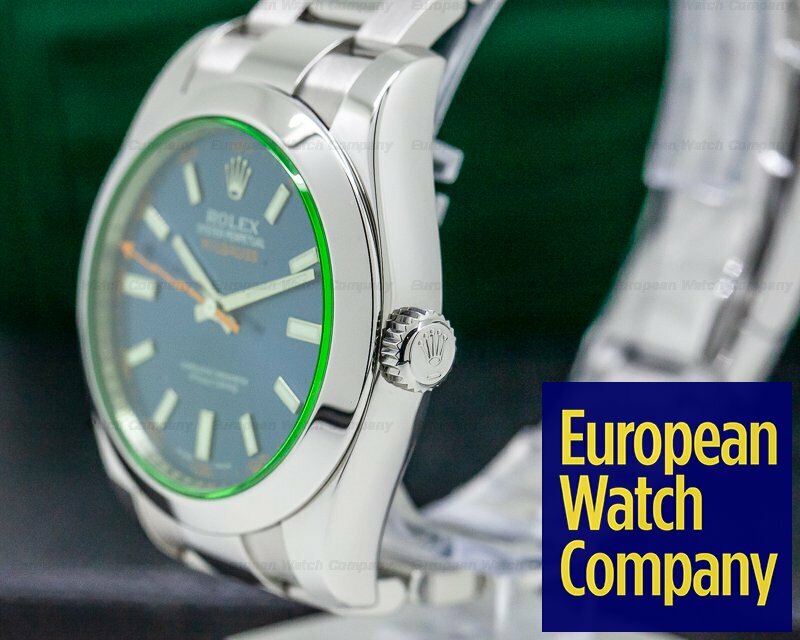 It has a solid screw-down case back engraved "Rolex Oyster - Milgauss," a screw-down winding crown with a Twinlock double waterproofness system, and stop-seconds for precise time setting. The 40mm diameter solid case, integral lugs, and angled bezel are polished. The dial is a "Z-Blue" combination of the domed green crystal with the blue dial, giving this watch a distinctive, extremely legible Chromalight display with long-lasting blue luminescence. It has applied faceted luminous baton hour markers with orange Arabic numeral minute indexes every five minutes, with orange division markers. 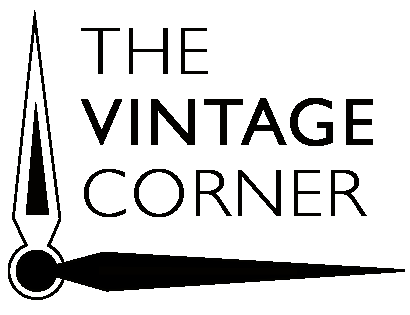 It has luminescent baton hands, an orange lightning stroke seconds hand, and it has a Contr�le Officiel Suisse des Chronom�tres (COSC) certification. It's water resistant to 100 meters/330 feet, and it has a 48-hour power reserve at full wind. 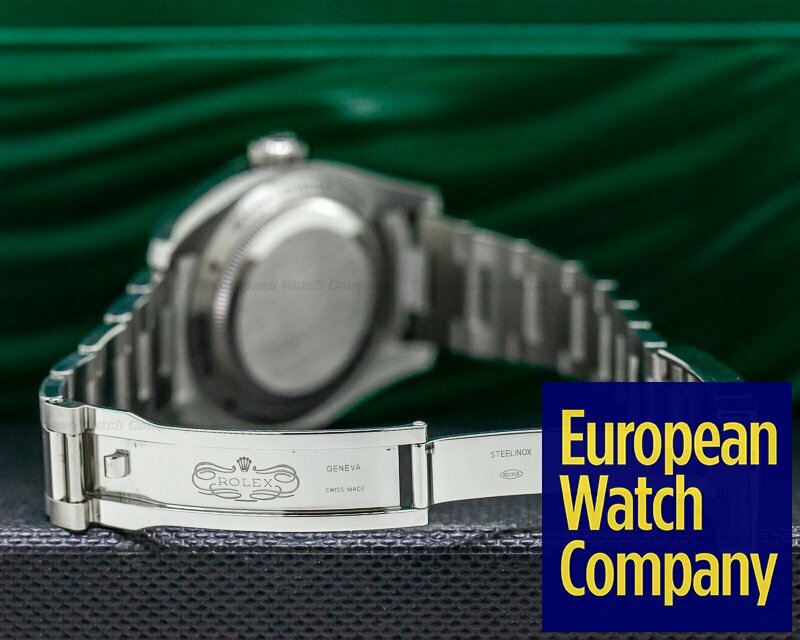 It has an inner reflector ring engraved with the serial number, and the 13mm thick case, dial, and movement are all signed. The mechanical automatic self-winding Rolex caliber 3131 movement is rhodium-plated, with fausses cotes and oeil-de-perdrix embellishment. It's constructed with 31 jewels, an Incabloc shock absorber mechanism, and a straight-line lever escapement. It includes a Glucydor monometallic balance that's adjusted to temperature and 5 positions, and a self-compensating free-sprung Breguet balance spring. It has Microstella regulating screws, a paramagnetic blue Parachrom hairspring, and a hacking mechanism for precise timesetting. 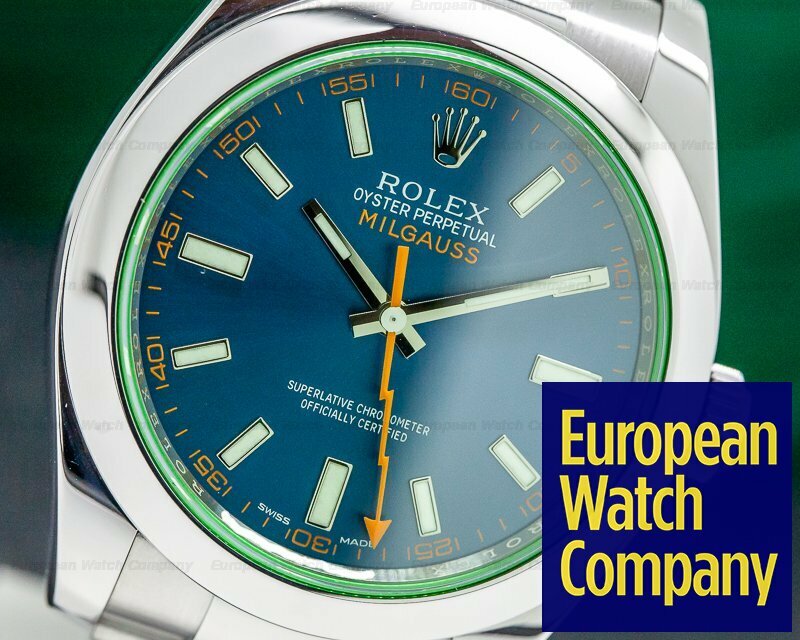 Rolex created the Milgauss in 1956 for professionals who worked near magnetic fields. 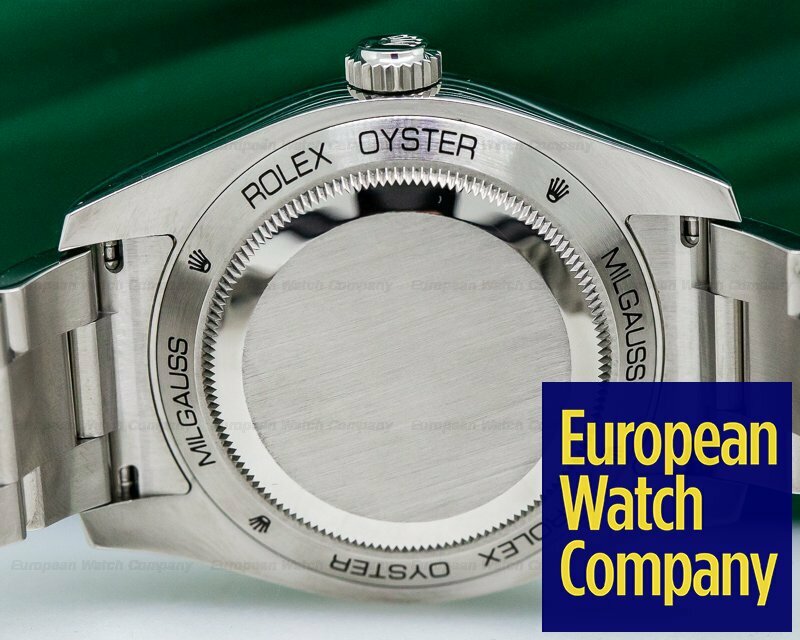 The innovative green sapphire crystal was introduced on the Milgauss in 2007. 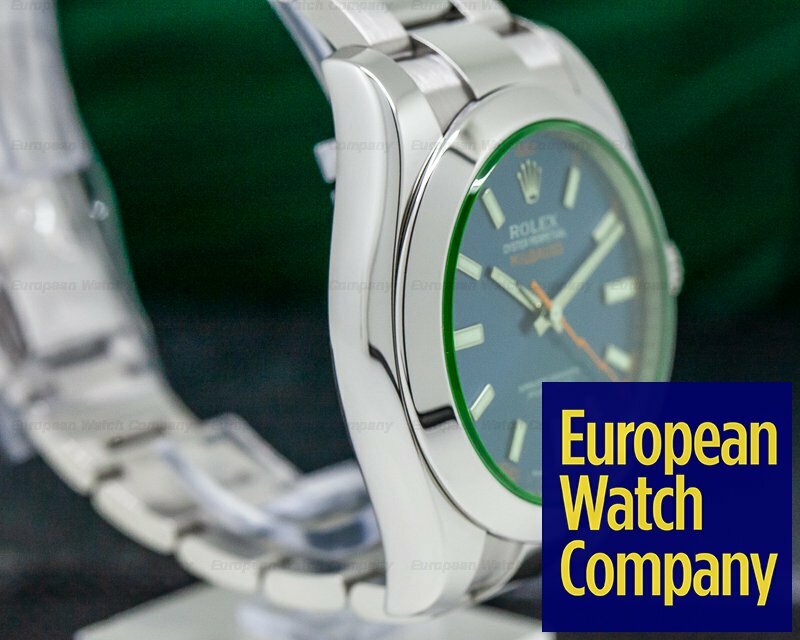 This Rolex Milgauss, reference 116400GV, debuted at the Baselworld exhibition in 2014.